Since before our family's leap into the wine business, sibling trio Tom, Gillian, and John Conway have always shared a passion for Santa Barbara wines. Over the years we watched the growth of the wine culture and wine industry in Santa Barbara, and shared a crazy desire to be a part of it. We always had wine on the table, and sharing wine during meals is a strong part of our family dynamic. Wine remains as one of the things that will always bring us together. 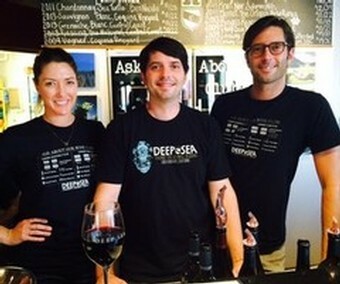 Starting in 2007, we have been responsible for the founding and creation of the Deep Sea and Conway wine labels, managing daily operations within the winery including harvest and production, fruit sourcing, label and product design, Deep Sea Tasting Room retail operations, Conway Wine Clubs and national sales. We all wear many hats within our small family business, and believe that our strength lies in working together, and always remembering that our passion for wine and family is the glue that holds us together, and is the foundation for making our dreams of producing excellent Santa Barbara wine come true. Our parents Chris and Ann Conway and our siblings Gareth and Sally Conway Wood are incredibly supportive of our dreams and are always there to bring new ideas, taste through new wines, and inspire us. All seven of us share ownership in Conway Family Wines. In addition to our passion for wine, we share a love of the arts, the wilderness and the ocean. Some of us surf, some of us sail, all of us are certified open water scuba divers. Our Deep Sea Tasting Room on Stearns Wharf overlooking the Pacific Ocean is a dream come true- there we combine our two greatest passions, wine and the water. We love our dogs, Rolo and Ringo (Rolo is undeniably the cuter of the two, but both dogs are always with us in the tasting room so you can decide for yourself). We love spending time in our partner vineyards and talking about, thinking about, sharing, and drinking Santa Barbara wine. We believe in sustainable agricultural and vineyard practices. We believe that the success of our winery is dependent on the passion we each share for this region, and our commitment to produce outstanding Santa Barbara wines. We all believe in making the best Santa Barbara wine we possibly can, and we hope to get better year by year. We are proud to share our wines with you and hope you’ll enjoy a glass or two with us!